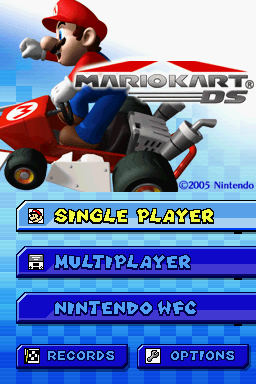 Mario Kart DS is one of the most popular games on the DS as well as one of the best selling Mario Kart games of all time. 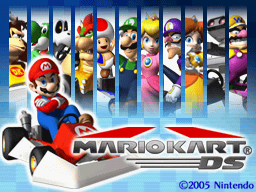 It's also the Mario Kart game that introduced the Retro Grand Prix, which has since become a series staple. 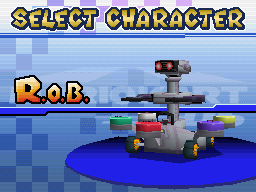 Also, R.O.B is a playable character for some reason. Two unused Archives with early Karts and Characters here and here. A number of unused and early objects. Find new videos for test1_course that accurately showcases how it appears in the final. Add documentation for the unused Ice collision type. Move some content such as "Early Objects" to sub pages, this article is getting too cluttered for it's own good. Some earlier versions of familiar karts along with some completely new ones. Early versions of a lot of junk on the road that didn't quite make the final cut. Add info for the restored test1_course model. There are a total of ten unused tracks in the game. Their textures don't load because the way the game loads textures changed between builds. In the unused courses they are located in their model file while the textures of the used tracks are in a separate archive. All tracks from the Kiosk Demo Version have the textures in their model files. A remake of the Mario Kart: Double Dash!! 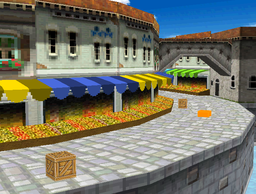 course that didn't make the final cut, although it was later featured in Mario Kart Wii. For the most part, this track is unfinished. Some of the textures are poor in quality and the vertex coloring on the castle isn't finished, plus not all details and features are there from the original, such as the door on the castle, or the stained glass window with Peach on it. Most surfaces that aren't a wall tend to use the collision type for normal road, and it's easy to go out of bounds, since the collision data is unfinished. There aren't really any objects either, aside from three item boxes right after the starting line. An unused beach-looking track. Judging by the filename ("Nokonoko" being the Japanese name for "Koopa Troopa"), it's possible it was going to be a Koopa Beach type of track. There is also a Goomba on the course. It appears to be glitched, and missing a frame of its animation, due to the Kiosk Demo version of the Goomba object being used. There are 10 respawns on the course, but they aren't finished, so the game crashes if you go out of bounds. Driving onto the grass where the 3 trees are located after the first ramp either crashes the game, or you just fall through the ground, since the collision type is listed as "sound trigger" in the final. The water still exists in the final, and Kiosk Demo version, however since the position of the water object is hardcoded, the Y axis of the course model is too high for the water to ever be able to reach the surface of the course. A course with two pipes, which was scrapped very early in its proof of concept state. The green checkered plane does have collision data, but it's set to a "Fall" value, and doesn't align with the model. It's likely that the course was also used to test falling off of certain tracks. There are 6 respawn points in this course, but they aren't completely finished, so the game crashes when you or anyone else falls off the track. A very small circular test track, with only one item box, and can be completed in a single lap. It's possible that this was used to test the different modes in the game, results, lap functionality, ect, since it's very fast to complete. A remake of the Block City battle course from Double Dash!! that was never finished. Only the main model is present, while some features of the original, such as the blocks are missing. 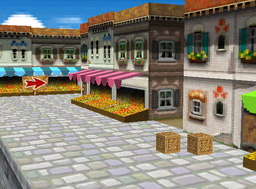 This course may have been used to test both Balloon Battle and Shine Runners battle modes. 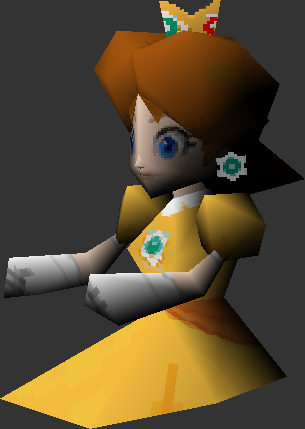 It also contains an updated, but still unused Shine Sprite model. The Big Bully boss mission file from the Kiosk Demo version is still present in the course data, although unused. A very early version of Waluigi Pinball. It seems to be said course in it's a proof-of-concept stages. The course has no item boxes and the cannon is only a slope with boost pads. Near the end, where all the bounds and flippers are located, there's a passage where the player can go underneath the course. The flippers themselves look different and have less details, and cause the course to crash in the final game, due to lacking the animation data the final flippers use for their electrical effect. Plus the course has a single respawn point, which like most other unused courses is unfinished, so it'll crash if you manage to fall off. In the Kiosk Demo version, the bound uses a very early model, while the final uses the bound model found in the files of donkey_course (pinball_course in the kiosk demo). The placements of the pin object are also still present in the .nkm file, although it doesn't load, since it's functions have been removed from the final version. A course that was used to test objects and collision. The objects that are used here are the bridge from Defino Square, one of the gears from Tick Tock Clock, and the blocks from Bowser Castle. The course also contains a lot of speed boosts, ramps, and the pipes that were only used in dokan_course. It also has a bunch of loops that aren't used anywhere else. 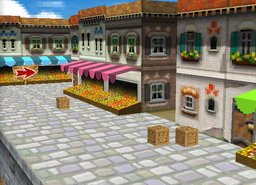 Originally, this course would crash the game, because it contains the early version of Bowser Castle's block object with the filename test_brock.nsbmd. By adding the final model to the object folder, the course will load. It will also work if you rename the said object to koopa_block.nsbmd, although it is a lot smaller than the final version's block, meaning that the object's collision won't match with this model. The original course model was overwritten by an early version of Rainbow Road, making it very difficult to navigate, unless you follow one of the AI to complete the race. The earlier version of Waluigi Pinball from the Kiosk Demo, with a very different layout. It also doesn't contain any pinballs. The original donkey_course was likely replaced with this course due to the collision type of the grass being changed to a "Fall" value for the final version, meaning the game would either crash when touching the grass, or you would just fall through it. The objects to the original said course, however, still remain in the object folder. The object behavior for the slots has also been changed. 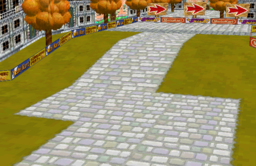 In the final version of Waluigi Pinball, the object file was made larger and flipped vertically, but the earlier version of the course still uses the Kiosk Demo model, which is why it appears to have been flipped horizontally. The collision data for them was also removed. Like luigi_course, the pin object placements still exist in the .nkm file, but it doesn't load since it's functions have been removed from the final. The bounds and flippers also still use the Kiosk Demo version of their models as well, but again the flipper model causes the final game to crash, due to it lacking the animation data for the electrical effect of the final model. The route where Wiggler should go, is only for one lap. The final uses 3 laps. 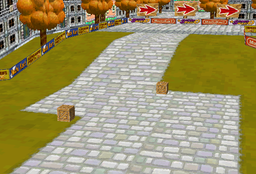 A duplicate of Wario Stadium, but it has slightly different road textures, lacks fireballs, and there's only three item boxes near the start. 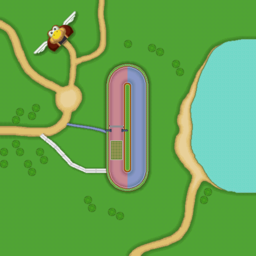 It's possible that the course could have been different during development, and was replaced later on, since the course model's internal name is "stadium_course", and the sky model's is "stadium_course_V". There is an alternative version of the first camera sequence from Luigi's Mansion: a view from the moon and the front side of the mansion, that was replaced by a view through the door. The second sequence has an alternative version, which is similar to the original sequence, but it has a different angle and was replaced by a more interesting view. 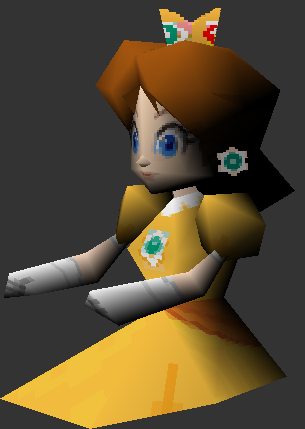 An earlier version of Daisy's CPU model, found in the unused KartModelMain.carc archive. Her head and arms are slightly different. The crown of the used model has some pink on it, unlike the unused one. 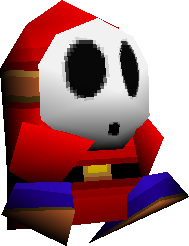 KartModelMain.carc also contains an early CPU model for Shy Guy, which is carried over from the Kiosk Demo. It is very simple and lacks 3D arms and feet. It is also green unlike the final model which is red. If you go out of bounds in mission 3-2, where you have to drive though gates in reverse on Delfino Square, you will see that there are crates in different positions with additional crates, different than they are in regular racing. This is a remnant from the Kiosk Demo version. 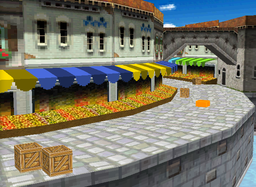 However, the two removed crates before the turn to the goal line were reused in Mario Kart Wii and can also be seen in mission 2-1. For whatever reason, the courses used for the boss battles in mission mode (mr_stage1, mr_stage2 and mr_stage3) have hidden skybox models, that can only be seen in an editor or by using cheat codes to fly out of bounds. They are copies from other skyboxes and doesn't fit the look of these courses at all. The Paratroopa shaped building in Baby Park cannot normally be seen on the touch screen map because it is too far out of bounds. By using cheats to fly out of bounds, however, it can be seen. The file mission.mr is a table containing configurations for missions. However there are 28 entries never used by the game, because they were scrapped. Note that MR stands for Mission Run. mr01 Drive Through Gates Yoshi GCN Yoshi Circuit 00:25:00 This is a scrapped mission from the Kiosk Demo. mr05 Collect 50 Coins Luigi SNES Mario Circuit 01:00:00 Another scrapped mission from the Kiosk Demo. Interestingly, Luigi uses his Poltergust 4000, although in missions in the final version, the drivers only use their Standard Kart. mr52 Collect 1 Coin Luigi MR_stage4 05:00:00 Collect 1 Coin with Luigi, might have been a test for the coin collecting missions. mr74 Defeat 15 snowmans Peach N64 Frappe Snowland 01:00:00 The Snowman object has an unused setting where it won't respawn after breaking it. It seems to have been intended for this mission. There is an unused sequence for a menu in the sound data of the game, called SSEQ_0005. It is one track away from the records screen, so it might have been used there. It has a resemblance to the Wi-Fi menu theme, and the settings theme too. 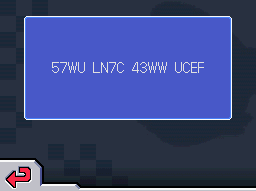 To hear this sequence on the title screen, use Action Replay code 121DB4A4 000001B0 (US). Located in the ARM9 binary is text, regarding a Ghost Data test, which suggests the internal project name of the game was "NitroKart". 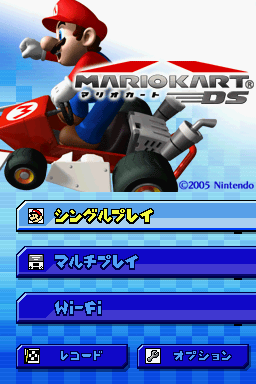 Mario Kart DS seems to pad out certain parts of memory with repeated instances of cute ASCII art which depicts Mario from Super Mario Bros.
Wi-Fi mode is labeled as "Nintendo WFC" in the International versions and "Wi-Fi" in the Japanese version. The most blatant regional differences involve R.O.B. 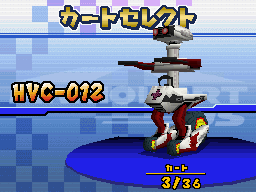 In the International versions, R.O.B. is colored dark grey (the general color of the NES), while in the Japanese version he is white and red (the colors of the Family Computer). Additionally, he is called HVC-012 in the Japanese version. 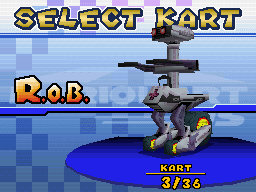 The ROB-LGS kart was similarly recolored. The title screen that appears after you beat the game was also changed. It's worth noting, however, that these changes aren't actually a direct replacement of any files - viewing a Time Trial ghost replay or playing multiplayer with a different version of the game will allow you to see both R.O.B. and HVC-012 at the same time. 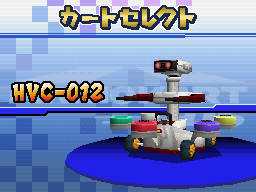 This is most apparent when viewing/racing a staff ghost using HVC-012 in the International versions of the game. Some tracks and karts have different names depending on the region. Retro courses keep their original localised names in each region. If you press Up, Down, L, R, Y, A in the Time Trials records, a 16 character code with information on your ghost will appear. It might have been for a contest, like in Mario Kart: Double Dash!!. A (long since broken) decoder isavailable online at http://ds.caitsith2.net/mkds/TTVerify/. This page was last modified on 21 April 2019, at 12:02.